Advanced Disk Space Monitor is an essential piece of software for system administrators who wish to remotely monitor disk space on servers and high-performance workstations. This is the perfect solution to avoid unexpected lack of disk space on systems with growing logs, enlarging databases, data backups, caching data, web servers, etc. Advanced Disk Space Monitor is not only useful for system administrators. It is also an essential tool for those that work extensively with a large number of files. It is ideal for users who frequently record and edit video and audio or process photos and create high-quality graphics. It is often the case that disk space runs out at the most inappropriate moment, leading to a risk of lost work. And this is not the only problem - insufficient space on the system disk may result in an unstable operating system. Server Edition provides the functionality to configure Advanced Disk Space Monitor to run as a service, so that you do not need to keep your server logged in all the time. The program can be configured to send email reports detailing free space on the selected disks. You can arrange data columns in any order and exclude the columns you do not require. Supports SMTP and secure SSL/TLS connections. Supported formats include Wav and mp3 audio files. In addition to notifications, Advanced Disk Space Monitor can automatically execute tasks, such as running applications and opening files. When available disk space has reached the specified limit, the program displays a warning similar to a Windows warning. If you no longer require system messages about the lack of free disk space, they can be disabled. 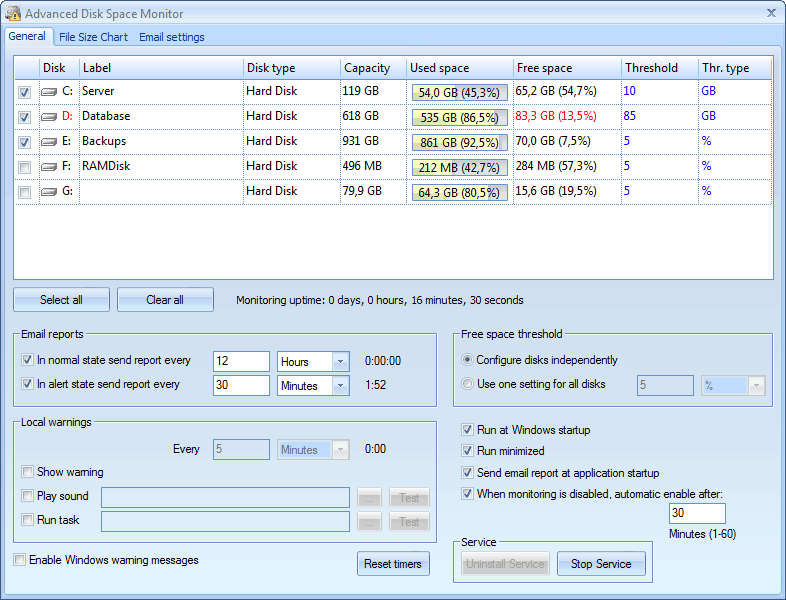 Download the 30-day trial version of Advanced Disk Space Monitor for free. Abaiko Disk Space Monitor is discontinued. The server and desktop editions are combined into a single solution: Advanced Disk Space Monitor. 1. Added support for Terabytes (TB) and Petabytes (PB). 2. Added ability to edit subject of email reports. 3. Minor improvements in email reports. 5. Improved service installation and uninstallation. 6. Fixed bug disabling automatic startup with Windows. 7. Fixed issue causing "Send test email" button to become permanently disabled. 8. Changed names of some interface items. 9. Changed main icon and system tray icons. 10. Floppy disks and CDs are no longer supported. Recommended update for all users. Fixed an infinite loop accessing the settings file.